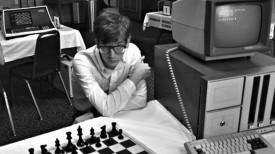 New York, NY – February 8, 2013 – Kino Lorber is pleased to announce that it has acquired all U.S. rights to Andrew Bujalski’s Computer Chess, which premiered last month at the Sundance Film Festival. This fourth film from acclaimed indie auteur Andrew Bujalski (Funny Ha Ha, Mutual Appreciation, Beeswax) is an exceptionally inventive comedy that won the prestigious Alfred P. Sloan Award honoring a film whose theme is science or technology. It was also previously awarded a Tribeca Film Institute Sloan grant in 2012. Computer Chess will have its International Premiere next week at the Berlin Film Festival and will also be presented in the U.S. at the upcoming South by Southwest Film Festival in Austin. A national theatrical release is planned for mid summer or early fall. The film, described as an “artificially intelligent comedy,” is set over the course of a weekend tournament for chess software programmers, circa 1980. It transports viewers to a nostalgic moment when the contest between technology and the human spirit seemed a little more up for grabs–back when the machines seemed clumsy and we seemed clever. But it’s the chance collision of this brainy bunch of A.I.’ers with another subculture of aging New Agers in a touchy-feely encounter therapy workshop, that wildly spins this wry portrayal into the stuff of a cult classic. Kino Lorber CEO Richard Lorber negotiated the deal for the film with Andrew Herwitz, head of The Film Sales Company on behalf of the producers. In addition, Canadian rights have been sold to Filmswelike and AMC/Sundance Channel Global previously announced taking Eastern European and Asian TV and VOD rights for its international TV networks. Starring Patrick Riester, Myles Paige, James Curry, Robin Schwartz, Gerald Peary, and Wiley Wiggins, Computer Chess was produced by Houston King and Alex Lipschultz, and directed by Andrew Bujalski.